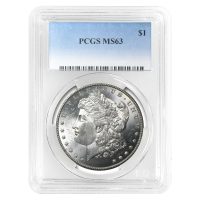 Dólar de Plata MS-63 PCGS Morgan 1878 - 1904 Benefit from the internet’s best rates, when you purchase your 1878-1904 Morgan PCGS MS-63 silver dollar from our online shop today. These exquisite Silver Dollars are considered amongst America’s most historically significant and collectible coins and have been awarded a high MS-63 rating on the trusted PCGS grading scale. Each coin’s reverse bears British artist, George Morgan’s bald eagle design; with majestic wings outstretched, the eagle bears an olive branch and arrows in its clutches. The eagle appears above a symbolic laurel wreath, with the denominational value below and the American legend and motto, ‘In God we trust’ overhead on the reverse, all within a dotted border. The coin’s obverse is home to the same artist’s striking version of Lady Liberty, created in the likeness of sitter, Anna Willess Williams and wearing a wheat and cotton dressed Phrygian cap with the word, ‘Liberty’ inscribed on the band. Also on the obverse, the latin motto, ‘E pluribus unum,’ along with 13 stars and the coin’s year of issue, all within a light decorative border.. These coins were the first silver dollars produced in half a decade, following the passing of America’s 1873 Coinage Act and have long been held as one of the country’s most popular treasures. Own this important piece of United States history and enrich your holdings with a1878-1904 Morgan PCGS MS-63 silver dollar today.